Having had mixed results with his collection of somewhat high-brow music videos in "Make Mine Music," Walt Disney decided to return to the tried and true for his next film. 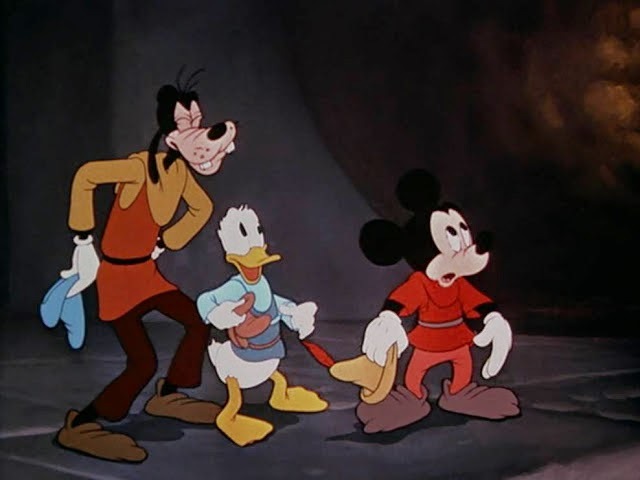 There being no better "tried and true" for Walt Disney Productions than Mickey Mouse, "Fun and Fancy Free" (1947) featured the happy-go-lucky rodent in a classic segment. 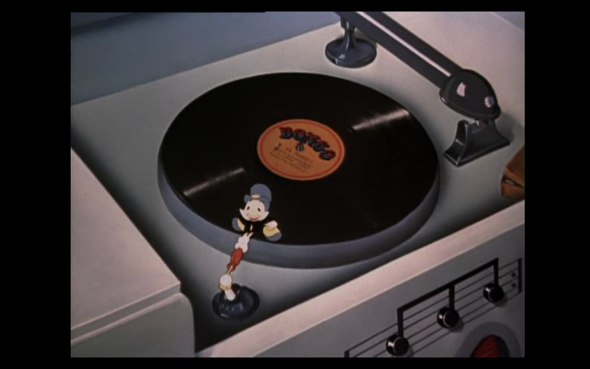 This being the Package Era, the studio also included a completely separate story featuring another classic Disney character, Jiminy Cricket, who opens the proceedings by actually singing a song called "I'm a Happy Go Lucky Fellow." Clearly, this was a film that aimed for a relaxed, laid back attitude, and "Fun and Fancy Free" achieved that goal in glorious fashion. 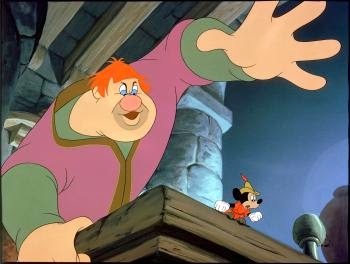 It would be the last time that the characters of Mickey and Jiminy headlined a Disney animated feature film because the Package Era was ending and a shift back toward traditional fairytales was in store. Mickey and Jiminy bowed out with gusto, though unfortunately this top-notch film has been largely forgotten by all but Disney fanatics. Jiminy Cricket is our master of ceremonies. 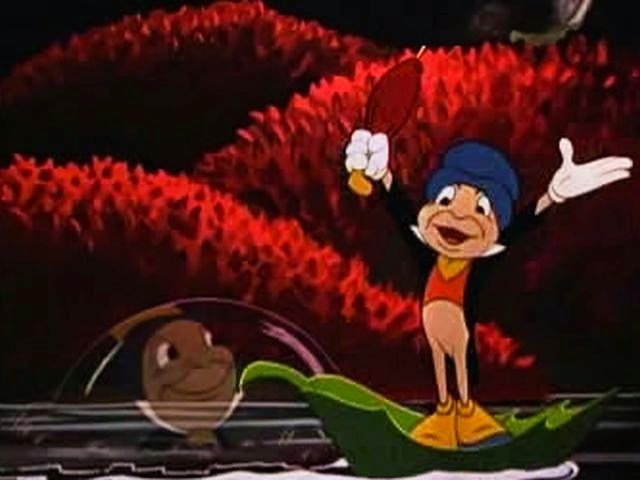 Emerging from a floating leaf, he sings "I'm a Happy-Go-Lucky Fellow" and wanders about as only Jiminy Cricket can. Eventually, he finds a record player, on which he plays the tale of the first segment. Dinah Shore narrates the first segment, "Bongo." 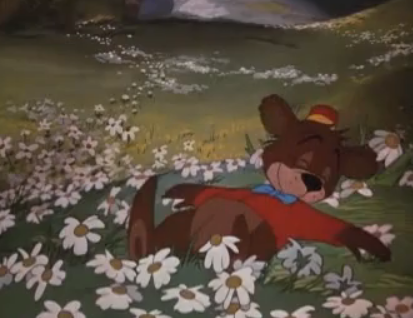 It is based on "Little Bear Bongo" by Sinclair Lewis. It follows the title character, a circus bear, who has been raised in the circus but dreams of living "fun and fancy free" in the wild. The circus audiences love Bongo, but behind the scenes the circus people are mean to him. Eventually, he has the opportunity to escape and finds himself in a forest. After realizing that living in the wild isn't all he had dreamed it would be, he meets, Lulubelle, a female bear. They hit it off immediately, but it turns out that Lulubelle already has a fearsome admirer, Lumpjaw. Lulubelle likes to show her affection by slapping people, but when she slaps Bongo, he doesn't know how to respond. She then accidentally slaps Lumpjaw, and Lumpjaw is quick to seize the opportunity and take Lulubelle as his mate. After all the other bears start celebrating Lumpjaw's success, Bongo finally understands that among the wild bears, slapping is a sign of love. He challenges Lumpjaw to a fight over Lulubelle, and they fight through the forest and fall into a river. After going over a waterfall, Lumpjaw disappears, but Bongo is saved by his distinctive hat. He returns and claims Lulubelle for his own. Ventriloquist Edgar Bergen narrates the second segment, "Mickey and the Beanstalk," with the help of his dummies, Charlie McCarthy and Mortimer Snerd. They are at a birthday party for Luana Patten, about eight years old at the time of filming, and Bergen and his dummy "friends" tell her the tale as a birthday present. They relate that Mickey Mouse, Donald Duck and Goofy live in Happy Valley. Unfortunately, the valley is not that happy because someone has stolen a golden harp from the local castle, causing a severe drought. Starving, the villagers cut their last loaf of bread into tiny slices. 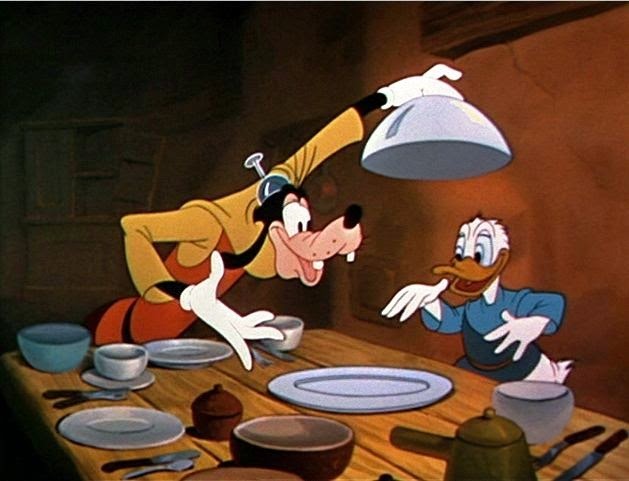 Starving, Donald goes after the town cow with an axe to get some food, but Mickey stops him and trades the cow for food. Goofy and Donald, though, are disheartened when they find out that Mickey was swindled and only received some magic beans. Donald takes the seemingly useless beans and throws them across the room, and the beans fall through a knothole in the floor. Finding soil, the beans grow that night and explode toward the heavens, lifting the entire house. Seeing the beanstalk growing to the sky, the three decide to climb it to see where it might lead. At the top, among the clouds, the three companions find a magical kingdom with a castle. Inside, they find a feast, to which they help themselves. 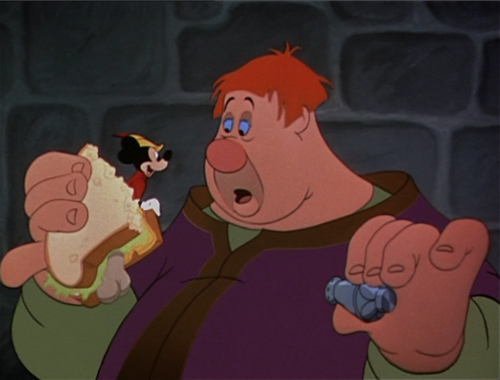 Willie the Giant, though, owns the castle and does not like people stealing his food. Confronted, Mickey asks Willie to prove his magical powers by turning himself into a fly, Mickey having the intent of swatting the giant with a flyswatter. Through some confusion, though, the giant instead turns himself into a pink bunny, and, seeing the trio with the flyswatter, realizes their treachery. He imprisons Donald and Goofy, while Mickey escapes. He goes in search of a key to the box in which the two are locked, and after finding a the missing golden harp, he returns and releases them. They then take the harp back to the valley, making everyone happy again, while chopping down the beanstalk to keep Willie the Giant away. There is an unusual breaking of the so-called fourth wall in a coda, wherein Willie returns and looks for Mickey in Hollywood. Willie sees the famous Brown Derby Restaurant, grabs it, uses it as a hat, and storms off. "Fun and Fancy Free" shows Disney edging slowly back toward traditional feature films, though not quite getting there yet. 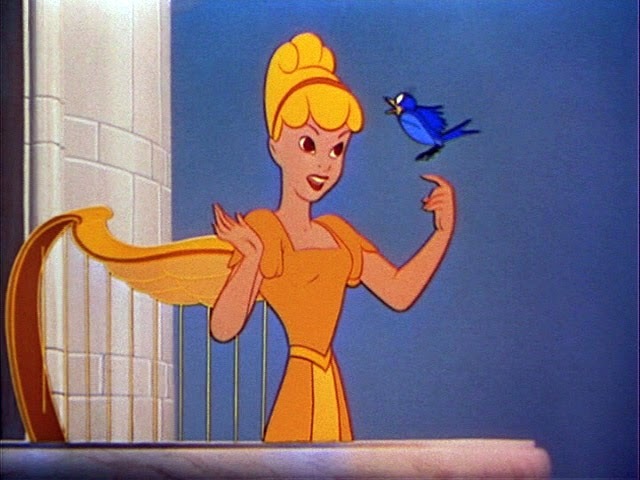 Both segments originally were destined for their own films, but during production Walt was not happy with the animation for either. He decided, therefore, to combine the two segments into one film to give the audience more bang for its buck. After some shuffling around with other projects, the two segments wound up together. Most would consider the second segment with Mickey the clear favorite. While Mickey Mouse was no longer quite the dominating star he had been in the early 1930s, he managed to carry off this final starring role with aplomb. 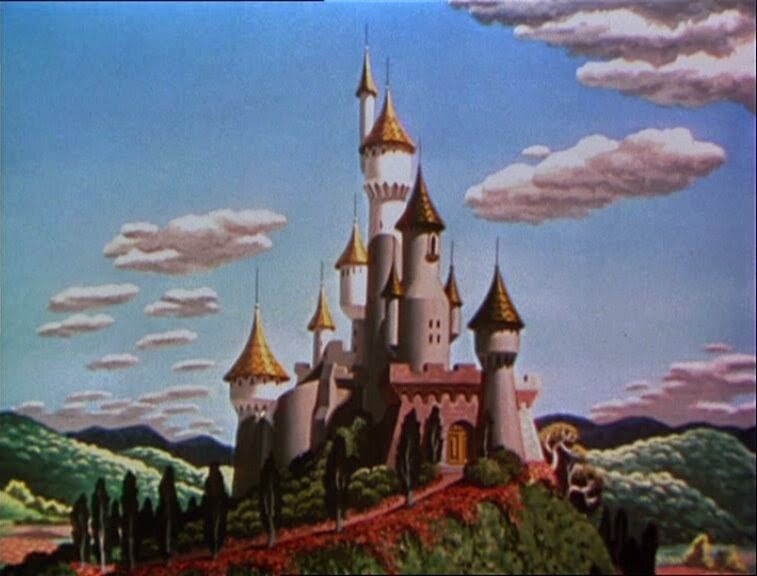 Walt himself voiced Mickey for the last time, while Cliff Edwards returned once again to do Jiminy Cricket as he had in the 1940 "Pinocchio" and Clarence Nash did Donald Duck, making "Fun and Fancy Free" rather nostalgic and very much the end of an era (thought not of any semi-official Disney era, for the Package Era was in mid-stream). It also marked a return to form for the studio, for while "The Three Caballeros" had contained some edgy, adult-type visuals and "Make Mine Music" had been a disjointed mess of music videos, "Fun and Fancy Free" returned Disney animation to the "cartoons" that appealed to children. As such, it was successful and helped to finance the classics of the 1950s such as "Cinderella" and "Alice in Wonderland." 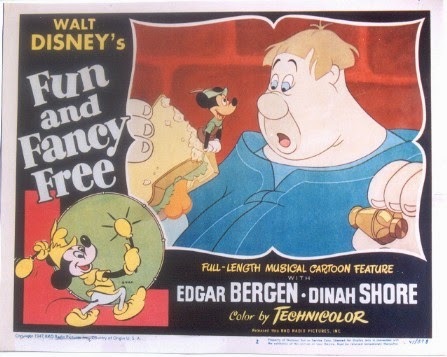 "Fun and Fancy Free," while often neglected by Disney fans, was the Disney studio at its peak. Legendary animators created the characters: Ward Kimball (Jimminy Cricket, Donald Duck); Les Clark (Singing Harp, Lulubelle); John Lounsbery (Willie the Giant); Fred Moore (Mickey); Wolfgang Reitherman (Goofy); and Art Babbitt (Bongo). The animators really ruled during this period of iconic characters, whereas in later eras story and music took center stage. 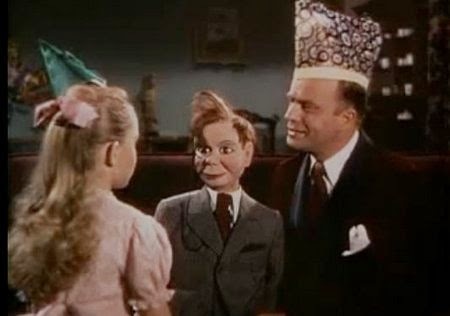 The use of Edgar Bergen and Dinah Shore as the narrators also marked the first instance of celebrity voice stars, an idea that peaked a couple of years later with Bing Crosby in "The Adventures of Ichabod and Mr. Toad" and then fell dormant for forty-five years. As a sign of how little consideration these choices merited at the time, the busy Walt casually replaced himself as the source of Mickey's voice with one of his sound guys, Jimmy MacDonald, and not, as would be done today, with some A-List actor. Definitely living up to its moniker as a fun film, "Fun and Fancy Free" remains quite enjoyable for the average viewer, which cannot be said for all the films of the Era. It is notable because it marks Mickey Mouse's last and greatest performance. As such, it merits a place on any animation fan's shelf, not least because the unique ending may have influenced later artists such as Mel Brooks who also used false endings that break the fourth wall in films such as "Blazing Saddles." 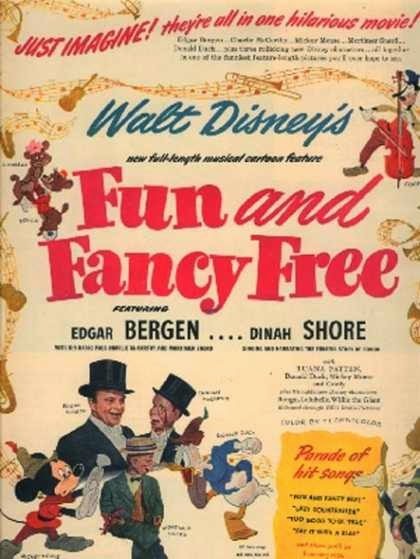 Below is the quintessentially 1940s main title music for "Fun and Fancy Free."